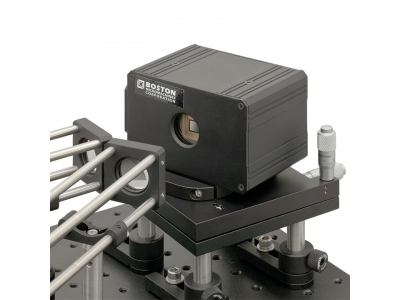 The 3502 optical chopper provides rock-solid stability and ﬂexibility because its chopping frequency is phase-locked to its own internal frequency synthesizer. 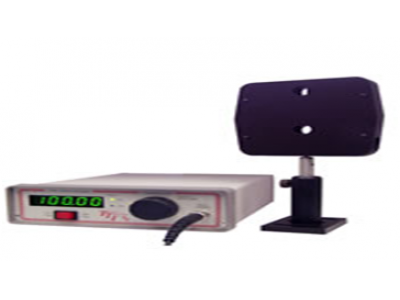 It can chop from 4 Hz to 10.65 kHz, using either the internal frequency synthesizer or an external source as the reference. You can chop at the fundamental, a harmonic (2 to 15), or even a sub-harmonic (1/2 to 1/15) of the reference. The 3502 optical chopper comes complete with six chopper wheels, a wheel cover, and a controller with A USB interface. 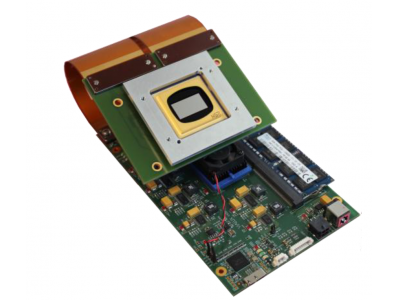 For stable chopping with minimum jitter and drift, the Model 3502 optical chopper uses precision photo-etched wheels mounted on a high-quality DC motor. In addition, the chopper controller has its own internal crystal-controlled frequency synthesizer and phase-locked loop for precisely locking the chopping frequency. A photo-interrupter on the chopper head monitors the chopping frequency, and the chopper controller actively stabilizes the motor speed to ensure stable chopping with a minimum of frequency drift. In internal-reference mode, the chopper controller uses its internal frequency synthesizer as the reference. When the Model 3502 is operated in external-reference mode, the chopping rate is locked to the user-provided reference from another chopper or signal source. The chopper may also be run asynchronously with the rear-panel analog-control-voltage input. In all cases, the frequency-synthesizer output is available on the front panel for use in your measurement setup. The reference signal can be divided and multiplied by the sub-harmonic and harmonic generators before being processed by the phase shifter. 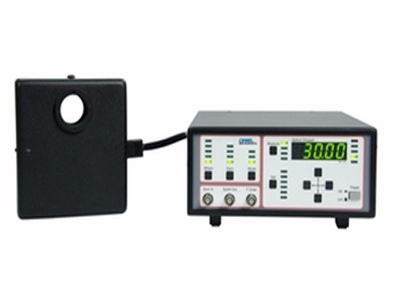 Unique features of the Model 3502 include outputs at the sum and difference of the inner and outer wheels’ chopping frequencies for nonlinear-optics experiments, and a high-stability phase shifter that can lock two choppers together for long ﬂuorescence-decay measurements. The chopping frequency, as well as a number of other operating parameters, can be viewed on the front panel display. Easy-to-use cursor keys provide easy adjustment of operating parameters. Six chopper wheels are included with the 3502 optical chopper system allowing for chopping frequencies from 4 Hz to 10.65 kHz. Shown in the top row are 2-slot and 60-slot wheels. The middle row shows 7/5-slot and 42/30-slot wheels, and the bottom row shows 60/2-slot and 100-slot wheels. All chopper wheels are 4.50 inch (114.3 mm) diameter. The front panel display of the controller allows monitoring of the chopping frequency, as well as a number of other operating parameters. Easy-to-use cursor keys provide easy adjustment of operating parameters. The chopping rate may be set from 4 Hz to 2.00 kHz, using either the internal frequency synthesizer or an external source as the reference. Chopping mode options are selectable at the fundamental, a harmonic (2 to 15), or even a sub-harmonic (1/2 to 1/15) of the reference.